The European Conservatives and Reformists (ECR) accounted for the third largest group of MEPs in the 2014-19 European Parliament. But the long-term prospects for the ECR are unclear, not least because its largest member – the UK’s Conservative Party – will no longer be present following Brexit. Martin Steven explains that despite facing stiff competition from a new group fronted by Matteo Salvini, there is likely still a future for the ECR as a voice for ‘Eurorealism’ in the European Union. For a group in the European Parliament of which many have little awareness, the European Conservatives and Reformists (ECR) have often found themselves at the centre of key developments in the European Union. It was David Cameron’s fateful decision to help establish the group in 2009 that set the United Kingdom on the road to the 2016 referendum by alienating his British Conservatives from the inner sanctum of the powerful European People’s Party (EPP). At present meanwhile, the group finds itself at the epicentre of the pre-election positioning of prominent populist and nationalist parties such as the League (Lega) from Italy and Fidesz from Hungary as they try to exploit their electoral popularity to the greatest effect after May. The ECR has been the third largest group – and therefore the ‘kingmaker’ – in the eighth session of the Parliament and is in many ways the most viable ‘Eurosceptic’ vehicle for these parties to join. The largest national delegation in the ECR after the Conservatives are Poland’s Law and Justice (PiS) – one of the first examples of a populist party in an EU member state actually forming a government. Three developments in the last week, however, suggest that this will not happen. First, on 8 April, Matteo Salvini, the Italian Deputy Prime Minister and de facto leader of Europe’s populists, declared that he will set up his own new group (the European Alliance for People and Nations) to try and build a large ‘Eurosceptic’ bloc in Strasbourg. 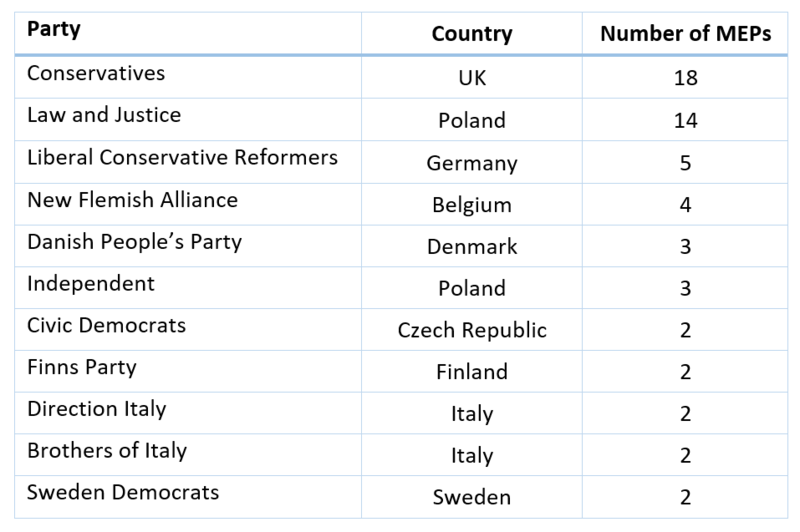 In doing so, he has already succeeded in attracting two current ECR group members – the Danish People’s Party (DF) and the Finns Party (PS) – who have pledged to join the new grouping in the summer (see the Table below). Salvini also expressed his hope that Law and Justice MEPs would team up with him in his new enterprise so it is clear that he has decided that ultimately, an entirely new movement altogether is needed to advance the cause of Euroscepticism in Brussels and Strasbourg. That is despite the fact he has apparently borrowed one of ECR’s most used slogans ‘towards a Europe of common sense’ (! ), echoing in many ways the ECR’s own ideological ‘Eurorealism’. Second, in any case, the leadership of the ECR has recently made it explicitly clear that it has no interest in providing the platform for Salvini’s electoral ambitions. In a tweet on 7 April to ‘stop rumours’, Czech MEP Jan Zahradil, who is the ECR’s Spitzenkandidat for the elections, stated that there will be ‘no merger with any group before or after’ the European elections, and that should any party wish to join it is welcome to apply. At the heart of this decision lies Polish and Czech distaste for Salvini’s enthusiasm for Russia and its role in European geopolitics. Law and Justice MEPs may well share the Lega’s brand of nationalism but also disagree profoundly in their respective attitudes towards Moscow. Third, with Brexit now having apparently been delayed until later this year, the UK will have to hold elections for the European Parliament in May like the other 27 member states – despite uneven poll ratings as a result of Theresa May’s missteps over how best to proceed after the 2016 referendum, the UK Conservatives can probably still expect to return a reasonable number of MEPs (perhaps 10 to 12) who will once again take up their seats on the ECR benches. Their presence will help to anchor the group (formally at least) in the centre-right and stave off any attempts to move it more explicitly into nationalist, populist territory. Leaving to one side its somewhat diverse membership, the ECR officially tries to promote ‘Anglosphere’ or ‘Atlanticist’ free market values with an emphasis on a small state and favourable conditions for trade and business. The term ‘Conservative’ is sometimes viewed with suspicion in European countries such as France but has more resonance in the English-speaking world and can be contrasted with the Christian Democratic social model found in continental Europe. So what does all of this add up to? The loss of the Danish and Finnish delegations, and indeed the potential new membership of Salvini’s Lega, can be considered a mixed blessing for the ECR – it might negatively affect its MEP numbers but it also reinforces the group’s sincere plea to not simply be regarded as another right-wing ‘Eurosceptic’ faction in Brussels but instead as the most visible representatives of centre-right ‘conservatism’. While it is perhaps unlikely that the group will grow substantially further and rival either the EPP or S&D (Progressive Alliance of Socialists and Democrats) in size, the potential to attract other moderate centre right parties from EU member states remains possible in theory. In reality, the group could well be left on the sidelines watching as Salvini’s new alliance goes into battle with a renewed ALDE (Alliance of Liberals and Democrats for Europe) re-energised by the support of French President Emmanuel Macron. Nevertheless, given that many had predicted the ECR would disappear altogether after 2019, it is no small achievement that the group actually looks likely to consolidate its position once more from 2019 to 2024 as the voice for ‘Eurorealism’ in the European Union. Martin Steven is a Lecturer in EU Politics at Lancaster University.